The Lord's commitment to make himself known throughout the nations is the missionary theme that spans the Bible, and is the central theological concern of the book of Exodus. Countering scholarly tendencies to fragment the text due to theological problems, Ross Blackburn contends that Exodus can be read as a unified whole, and that an appreciation of this missionary theme in its canonical context is of great help in dealing with difficult issues that the book poses. For example, how is Exodus 6:3 best understood? Is there a tension between law and gospel, or mercy and judgment? How should we understand the painstaking detail of the tabernacle chapters? - the Lord deals with Israel's idolatry severely, yet mercifully, for his goodness cannot be known if his glory is compromised. 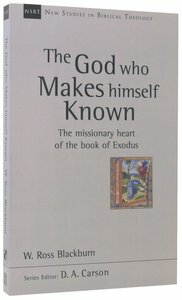 About "The God Who Makes Himself Known: The Missionary Heart of the Book of Exodus (New Studies In Biblical Theology Series)"